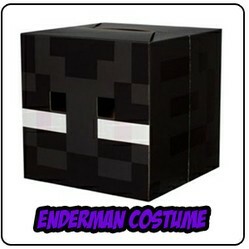 Enderman Costume - Last Halloween, you would have been hard pressed to find any look more popular than Minecraft costumes. First we were introduced to the sensational Steve costume. Then the cool Creeper mask was released and the world was never quite the same. For 2014, however, Enderman is sure to be among the hottest new looks of the season. If you have kids under the age of 15 then this should, of course, come as no surprise seeing as how popular this character has become since his first appearance a few months back! If there is a costume that you can be absolutely certain you child will love this year it is this Enderman costume. Based on the magnificent mob known only as the Enderman, this officially licensed mask truly captures the spirit of this temperamental character perfectly! For those of you that may not be too familiar with this pixilated world of perfection, Minecraft is a retro-inspired video game that has truly captured the imagination of millions of kids, as well as adults, across the globe. The basic, overall, goal of the game is to mine stuff and then to craft things from the raw materials collected; hence the super creative name. It is the character interaction, however that helps to take your experience over the top! As previously mentioned, it is the mobs that really make or break your experience while playing this game. Sure, there are a number of passive characters, such as chickens, pigs, and even horses, but it is the ones that can, and will, attack you that make things interesting. Unlike the crazed Creeper, that will attack you on site, the Enderman starts out relatively neutral. If, however, you look directly into the eyes of this eerie mob, it will attack; ultimately showing you no mercy. You will know when you have incurred their wrath when you hear them scream this incredibly spooky and loud sound. The Enderman will then freeze for a few seconds, during which time, you really should be running as far away as you can; little good that it will do you. While it is certainly true that running will work against many hostile mobs, these guys will simply continue to pursue you until it, or you, is dead. You can, if you get lucky, try and cross a stream; they hate water which causes them significant damage. You can also try and get another hostile mob, such as the Creepers, to attack them although I have never personally had much luck with that approach! Which Minecraft Costume is Your Favorite?